Best Classic Pyramid Solitaire brings the popular Pyramid version of the solitaire card game to the palm of your hand. In Pyramid solitaire 28 cards are dealt face up to form a pyramid. The rest of the 52-card deck is placed face down at the side forming the Stock. Your objective is to remove pairs of exposed cards from the foundation of the pyramid whose values add up to 13. Aces value at 1, Jacks 11, Queens 12. Kings value at 13 and can be played individually. You may draw cards from the Stock to match them with any exposed card. The game is won if all cards of the pyramid got paired and removed from the table. 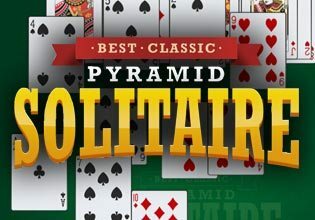 The faster you pair the cards, the higher you will score!Play Best Classic Pyramid Solitaire now for free and enjoy this card game masterpiece!